Three Vs were uncovered in a complex of rooms carved into the bedrock near the Gihon Spring in the City of David. 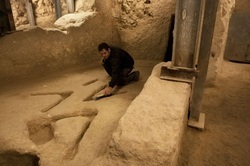 Ronny Reich and Eli Shukron rediscovered the carvings in early December 2011. Capt. Montague Parker, a British adventurer and proto-archaeologist, reported finding similar carvings a century ago in another house nearby and published them. What archaeologists can say with certainty is that potsherds associated with the find indicate that the rooms with the Vs were last used around 800 B.C., at which point they were filled with rubble to support the construction of a defensive wall. 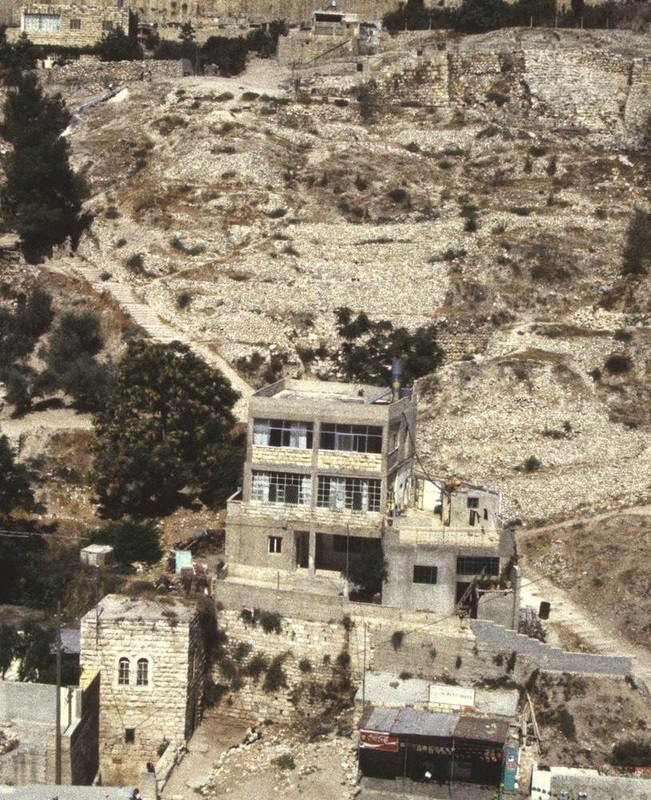 The straight lines of the house's walls and smooth, level floors suggest that special effort was put into building the complex, and its location just above the Gihon Spring point to their having an important purpose. But the findings also suggest that the rooms were an ordinary place where the daily life of a Biblical city went on. Archaeologists discovered nearby the remains of olive presses and a small upright stone. There is a pointer to what the carvings on the floor are all about in the form of a dozen or so weights used to hold down threads from a loom, which were discovered in an adjacent room. "It's possible that these Vs were used to hold upright vertical looms," Reich said (The Jerusalem Post). ​•Qumran (1970-71). Fr. Roland de Vaux demonstrating how clothing was laundered at Qumran, where items were washed and patted dry on flat stone, as it was done in rural France during his childhood. He is kneeling in Locus 52. (By permission from the collection of Professor Philip Davies, Emeritus Professor at the University of Sheffield). Whether it be Qumran in the first century or the City of David in the Iron Age, an area with a smooth limestone floor was utilized for the "fulling," or whitening of clothes. The patriarch of the Jewish nation, Abraham, was presumably nurtured in Akkadia, the most advanced civilization of its time. It is written that Abraham and his entourage emigrated from Akkadia (Biblical Shinar) to establish himself and his posterity in Canaan. Mesopotamian statues and iconography, dating from earlier than 3000 B.C. into the Akkadian period, depict woolen textiles of diverse weaves, some richly patterned and others with looped fringes. The cleansing and coloring of these textiles was a sophisticated and secret art. The Jews became privy to those secrets, and that knowledge was one of the mainstays of the textile industry as it was practiced by the Jews in the Diaspora into the modern era. The complex of rooms is located underground, just behind the building at the center of this photograph. The Gihon Spring is at bottom-left while the Stepped-Stone Structure can be seen at upper right (photo by A. Chrysler). 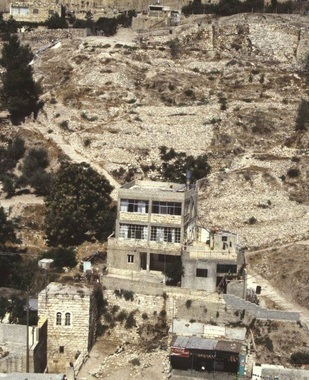 The complex of rooms recently found near the Gihon Spring by Ronny Reich and Eli Shukron may have been used by the fullers in king Hezekiah's day. It has been noted that the top of Warren's Shaft was cut through in the time of Hezekiah. This complex of rooms is adjacent to the top of Warren's Shaft and it would have been possible for the fullers to draw water from there. ​"The Siloam channel was the initial means of conveying the waters of the Gihon to reservoirs to the south; at the same time, it also enabled utilization of the waters for irrigation in the Kedron Valley. The major disadvantage of this early system was that , as noted, all its components - spring, channel, and pool - were situated outside the walls of the city. Hezekiah's Tunnel provided a sophisticated remedy: not only was the entire conduit concealed beneath the rock surface but also the area of the reservoirs was not brought into the fortified area of the city, the walls having been extended to include the Western Hill. Warren's Shaft was built according to the usual formula for underground water systems at royal centers in the tenth - ninth centuries B.C. It connected the northern part of the City of David (and perhaps even its citadel) with the water source. In the late eighth - sixth centuries B.C., the three systems could have functioned simultaneously, all fed from the single source, and the flow of water through them could have been controlled. Hezekiah's Tunnel has continuously conveyed water to the Siloam Pool ever since. Water could also reach the base of Warren's Shaft, from whence it could be drawn for use in the city directly above." (Yigal Shiloh, ARCHAEOLOGY AND BIBLICAL INTERPRETATION, 1982, Underground water systems in Eretz-Israel in the Iron Age, p. 220). Isaiah 7:3 - Then said the Lord unto Isaiah, "Go forth now to meet Ahaz, thou, and Shearjashub thy son, at the end of the conduit of the upper pool in the highway of the fuller's field". The "conduit" mentioned here must refer to the northern end of the Siloam Channel as Hezekiah had not yet become king and had yet to construct his tunnel. According to Strong's concordance, Fullers' (#3526) is translated, "to trample; hence to wash (prop. by stamping with the feet) and Field (#7704) to spread out; a field (as flat)". Isaiah 36:2, 3 - And the king of Assyria sent Rabshakeh from Lachish to Jerusalem unto king Hezekiah with a great army. And he stood by the conduit of the upper pool in the highway of the fuller's field. Then came forth unto him Eliakim, Hilkiah's son, which was over the house, and Shebna the scribe, and Joah, Asaph's son, the recorder. These verses refer to the exact same spot as Isaiah 7:3 but Hezekiah was now king. According to the IAA, "Loom weights and a beaten chalk floor were covered with a thick layer of small stone chips that derived from the quarrying of a hard bedrock layer, when the Warren's Shaft system was made deeper. The loomweights indicated that at the end of Iron Age II the place ceased to be used as a public underground water system and was taken over by private individuals, who were engaged in weaving." II Kings 18:17, 18 - And the king of Assyria sent Tartan and Rabsaris and Rabshakeh from Lachish to king Hezekiah with a great host against Jerusalem. And they went up and came to Jerusalem. And when they were come up, they came and stood by the conduit of the upper pool, which is in the highway of the fuller's field. And when they had called to the king, there came out to them Eliakim the son of Hilkiah, which was over the household, and Shebna the scribe, and Joah the son of Asaph the recorder. When Rabshakeh called to king Hezekiah, Eliakim the son of Hilkiah, which was head over the household, came out to them. Isaiah 18:18 helps us to understand that Rabshakeh was very near the palace when he called to the king. The previous verse tells us where they were when they called to the king: "...by the conduit of the upper pool, which is in the highway of the fuller's field". The Hebrew word for field is sadeh and, according to Strong's Concordance, means to spread out: a field (as flat). The palace has been shown to be on top of the ridge and the upper pool, with its associated conduit, is located at the bottom of the ridge. The area in between, just outside the mid-slope wall, was utilized by the fullers.